Green Schools Initiative : Tips for Teachers: Start the School Year Off Green! Transition back into the school year with green activities! It's a great way to enjoy the final days of summer weather, establish green expectations and procedures from the very start, and have some fun! It's also an important step in reducing the environmental footprint of your classroom. Check out our Tips for Greenifying your classroom, below. Also, check out the Resources on our Teach Green page for great activities and lessons! Include environmental sustainability in your class Welcome Letter to students and parents. Suggesting that they look for environmentally-friendly school supplies and reuse supplies from last year makes a big impact on classroom waste and resource use. Have a look at our Green Back-to-School page for more! Also, check out the downloadable sample letter from the San Francisco Unified School District below that you can adapt for your own school. Use our Checklist for a Green Classroom. You can also use the checklist to create a Green Classroom award for your school! Share with your fellow teachers! Establish classroom jobs to turn off electrical devices, take out the recycling and compost, water the plants, etc. to engage kids in green activities and teach them healthy green practices! 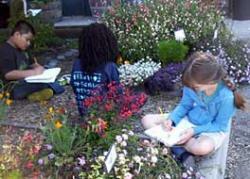 Conduct simple math, reading, and other lessons outdoors! Check out these ideas from We Are Teachers . Having class outside is a great way to spice things up-kids love it! Reform recess with simple natural materials and outdoor activities on the schoolyard, see ideas Here. Incorporate technology such as Instagram into your environmental curriculum. Adapt the ideas in this Article towards nature and environmental themes -- a tech-savvy youth-minded way to promote environmental sustainability! Tell stories of summer activities using the lens of nature (whether a city park, a sidewalk ecosystem, a backyard, a beach - it can be "urban nature," neighborhood nature, not just "wilderness"). Follow these suggestions -- or make your own -- to start school off with kids excited about learning, playing and improving our environment!